Routledge. Hardcover. 0415658446 Special order direct from the distributor . New. Yale University Press, 1998-03-30. Paperback. Used:Good. New Haven: Yale University Press. As New in Near Fine dust jacket. 1990. First American Edition. First Printing. Hard Cover. 0300046537 . Publisher's full red cloth, gilt lettering on spine, red endpapers. Illustrated with numerous B&W photographs, line illustrations, maps, plans and family trees. Includes extensive Notes and References, Bibliography and Index. . The volume is in perfect, pristine condition, unmarked, tight, square and clean. The unclipped dust jacket shows only the slightest shelf-wear. AS NEW/NEAR FINE. . B&W Illustrations. 8vo 8" - 9" tall. xxvi, 334 pp . New Haven/London:: Yale Univ. Pr.. VG, clean HB; no DJ.. 1989. ISBN: xxvi + 334 pp.. Catalogs: HISTORY - ROME. Keywords: Caligula, Classical Studies. New Haven, CT: Yale University Press, 1990. First printing. Hardcover. Very near Fine/very near Fine. 334 pp. Bound in red cloth with gold lettering on the spine. A study of Caligula, Roman emperor from A.D. 37 - 41. Yale University Press, 1989. Large, heavy book. DJ has crease near bottom front edge. Near Very Fine DJ/Very Fine book.. Hard Cover. Fine/Near Very Fine. Yale University Press, 1990-05-01. Hardcover. New. New Haven, CT: Yale Univ. Press. VG in VG DJ. (1989). 1st ptg. Was the Roman emperor a depraved despot? Barrett draws on archaeological, numismatic & literary evidence to evaluate him. .
Yale University Press. Very Good in Very Good dust jacket. 1990. First Edition. Hardcover. All dust jackets are in Mylar acid-free protectors. .
Yale University Press, 1990. Hard Cover. Near Fine/very good. Igor Galanin. 334 pgs. Dust JAcket and Book, near fine. Facts well researched about the insane roman emperor. A great read and reference. : Yale Univ Pr, 1990. Hardback. Very Good/Very Good. Yale Univ Pr, 1990 Hardback. Very Good/Very Good. New Haven: Yale University Press, 1990. 1/31/2011. Fine/Fine. First American edition. 334pp. Illustrated with black and white plates. Fine in a fine dustwrapper. Yale University Press, 1989 Good condition. 300+ page text is clean. DJ good, near new. Previous owner has blacked out his name on ffep with black marking pen. Solid copy..
New Haven: Yale, 1989. Near fine; very good dust jacket. 8 vo. (xxvi) 334 pp. Notes & references, bibliography, index, maps, b/w plates, family charts, red paper-backed boards. Book of Month Club note on copyright page.. Hard Cover. Near Fine/Ver y Good. Yale University Press, 1990. Hardcover. Very Good. Spotting to page edges, no other markings. Dust jacket is in a protective cover. Routledge, London and New York, 2001,. see description. large paperback, xxvi,334pp, 31 photo-illustratons on art paper, 13 line illustrations (stemmata, maps and plans), card covers illustrated by a bust of Caligula. almost as new. Routledge, 1/26/2006. Paperback. Very Good. Softcover. Good binding and cover. Light shelf wear. Clean, unmarked pages. Ships daily. New Haven: Yale, 1989. Cover spot, corner bumped, very good; no dust jacket. 8 vo. (xxvi) 334 pp. Appendices, notes & references, bibliography, index, red cloth.. Hard Cover. Cumberland, Rhode Island, U.S.A.: Yale Univ Pr, 1990. 334pp. Index, Biblio., Notes, Illus. Light soiling edges, wear boards, DJ: wear extremities, rubbing.. Book Club. Hb. VG-/VG-. New Haven, CT: Yale University Press, 1990. Hardcover. Very Good. 334 pages. 6-1/4" x 9-1/2". Indexed. Photos and maps. Ex-library copy Library markings are the only detractors from condition of this book - otherwise in EXCELLENT condition. New Haven, CT, U.S.A.: Yale University Press, 1998 Reprint. Trade Paperback. Very Good. 8vo - over 7¾" - 9¾" tall. New Haven: Yale University Press. Hardcover. 0300046537 Octavo . Very Good. 1989. Cumberland, Rhode Island, U.S.A.: Yale Univ Pr, 1990. Dj mildly edgeworn.. Hard Cover. Very Good/Very Good. New Haven: Yale University Press. VG+/VG+. 1989. Book Club Edition. Hardcover. ISBN: 0300046537. 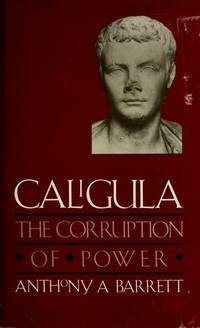 Slight wear to edges of book & DJ; nice copy ; The first major reassessmentof Caligula's life and career in over 50 years, the author draws on archaeological, numismatic, and literary evidence to evaluate this leader in the context of the system that gave him absolute power; 8vo; 334 pp. Catalogs: Political Leaders. Keywords: Caligula, Roman Empire, History, Biography, Ancient Rome. New Haven: Yale University Press, 1989. 334pp. Index. Highlighting interior, light soiling, DJ: wear extremities, rubbing, scuffing.. Hb. G/VG-. Routledge. Used - Good. Ships from the UK. Former Library book. Shows some signs of wear, and may have some markings on the inside. 100% Money Back Guarantee. Your purchase also supports literacy charities. New Haven: Yale University Press (1990), 334pp, illus., red cloth, slight soiling to pg edges, slight rubbing & edgewear to dj.. Cloth. Very Good -/Very Good -. New Haven: Yale Univ. Press. 1990 1st Am. ed. 334pp. illus. red cloth tall 8vo: near Fine in a Very Good dj. New Haven, CT: Yale University Press, 1990. Hardcover w/dustjacket. Excellent/Good. 334 pages. Minor wear at corners, otherwise VG jacket. Text in fine condition. Simon & Schuster, 1991-04-01. Paperback. Good. Book is in good condition, cover has some wear along the edges. Riverside, New Jersey, U.S.A.: Simon & Schuster, 1991. 334pp. Index, Biblio., Notes. Light soiling, wear extremities, rubbing.. Paperback. VG. Yale Univ Pr. Used - Good. Ships from Reno, NV. Shows some signs of wear, and may have some markings on the inside. 100% Money Back Guarantee. Shipped to over one million happy customers. Your purchase benefits world literacy! Yale Univ Pr. Used - Acceptable. Shows definite wear, and perhaps considerable marking on inside. Yale Univ Pr. Used - Good. Former Library book. Shows some signs of wear, and may have some markings on the inside. Simon & Schuster (Paper). Used - Good. Good condition. Yale Univ Pr, 5/1/1990. Hardcover. Good/Good. Cloth hardcovers are clean, minor shelfwear. Interior clean, binding secure. Dustjacket lightly rubbed. Professional bookseller for twenty years. Orders shipped daily in cardboard bookfolds. Seller: Commonwealth Book Company, Inc.
Cumberland, Rhode Island, U.S.A.: Yale Univ Pr, 1990. Book Club Edition . Hardcover. Fine/Very Good. 8vo - over 7¾" - 9¾" tall. Bce. (Book Club Edition). Includes Bibliographical References And Index. The Book Is Bound In Red Cloth With Gilt Stamped Lettering On The Spine. The Jacket Has Minor Wear. Yale University Press. Used - Good. Good condition. Good dust jacket. Bookplate inside. Yale University Press. Used - Very Good. Very Good condition. Good dust jacket. May 01, 1990. Fine. Publisher: Yale Univ Pr, Date of Publication: 1990, Condition: As New, Hardcover With DJ, DJ some wear. New Haven, CT, U.S.A.: Yale University Press, 1989. Book Club (BCE/BOMC). Hard Cover. Very Good/Very Good Dust Jacket. 8vo - over 7¾" - 9¾" tall.